Cucumbers are in their peak season. 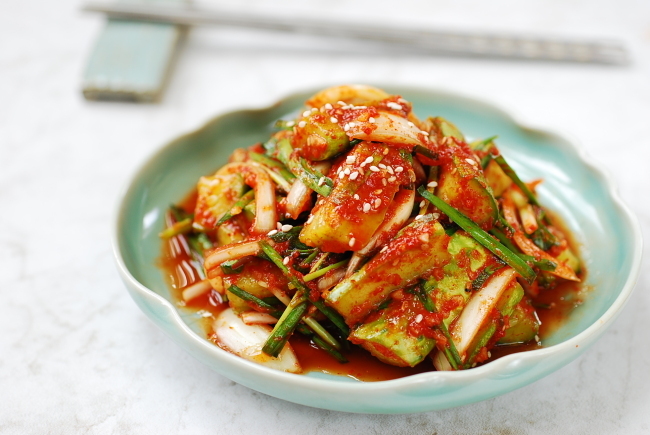 This recipe is a quick and easy kimchi you can make with summer’s abundant cucumbers. It’s crisp, crunchy, and delicious. Buchu, or Korean garlic chives, is commonly added to oi kimchi, but you can use scallions instead if you like. Although not used in this recipe, a little bit of julienned carrot or red pepper will give the kimchi a nice pop of color. To make kimchi, you will need to salt the cucumbers first to draw out some water. This will add extra crunch to the cucumbers. I used equal amounts of saewujeot (salted shrimp) and myeolchiaekjeot (anchovy sauce). For a lighter taste, you can simply use saewujeot. This kimchi can be eaten right away, but it will get better over a few days. Cut the cucumbers crosswise into 3- to 4-centimeter-long pieces. Cut each piece lengthwise into quarters. Add the salt, and toss well to evenly distribute all over the cucumbers. Let them sit for about 30 minutes. Drain the cucumbers well in a strainer to remove the water released. Do not rinse the cucumbers. Cut the garlic chives into 3-to 4-centimeter-long pieces. Thinly slice the onions. Add the onion and garlic chives along with all the seasoning ingredients to the salted cucumbers. Toss everything until the cucumbers are well coated with the seasoning. The cucumbers will look dry at this point, but will release moisture as they absorb the seasonings.